Respectability in eating places was not easily achieved then and it’s surprising that Fera’s was able to rescue its reputation from a scandal it was caught up in not long after opening. It was constantly in the newspapers in 1857 because of a sensational divorce case in which a husband alleged that his wife had committed an “adulterous act” in Fera’s. Although the defendant’s lawyer argued that no such occurrence took place since the restaurant was “a wide hall” that was “open all the way through” (i.e., not divided into small private rooms or boxes), the divorce was granted, branding the defendant as an adulteress and leaving in doubt what had occurred where. Somehow Fera’s survived the scandal, as well as George Fera’s own marital breakup, fires, robberies, changes of address, and a couple of bankruptcies. At the Tremont address Fera’s was divided into two sections with the restaurant occupying space behind the confectionery and separated by an arched doorway. After redecorating in 1887, the restaurant was painted in cream and gold, with lower walls in marble and upper walls hung with large mirrors. Electric lights were installed, producing a bright and glittering style that emulated a Paris café. Like many Europeans in the culinary trades who came to this country, George Fera had traveled a prestigious career path before arriving on U.S. soil in his early 20s. Born in Lübeck, Germany, he compressed a lifetime into a few years. Starting out at a young age he had trained in confectionery in Paris, succeeding so well that he was appointed confectioner to the Czar of Russia in St. Petersburg, where he remained for a number of years. Upon his arrival in the United States, he went to work at a New Orleans hotel, moving from there to New York City where he was employed by the famed confectioner Henry Maillard. He was said to have made for Maillard’s the first caramels produced in this country. Everyone knows that being a restaurant proprietor is chancy. 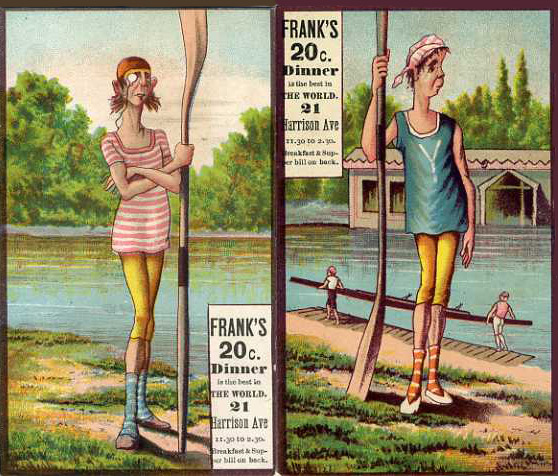 This is amply illustrated in the life of Frank Flower, born in England in 1854, and working as a Boston waiter in 1878. He staked his career as a restaurateur on Harrison Avenue in Boston where he ran a restaurant from about 1880 to 1895, moving twice. The reason for his failure in 1895 is unknown, but it may have had something to do with shifts in the neighborhood beginning just as he opened at 13-15 Harrison in 1880. That was the year that the first property lease was made to a Chinese person in Boston, on Oxford Place, very near to Frank’s restaurant. Frank had catered to patrons whose tastes ran to fish balls and baked beans. 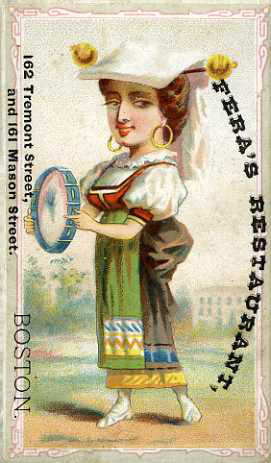 But, little by little by the 1890s Harrison would become a business street in Boston’s Chinatown. 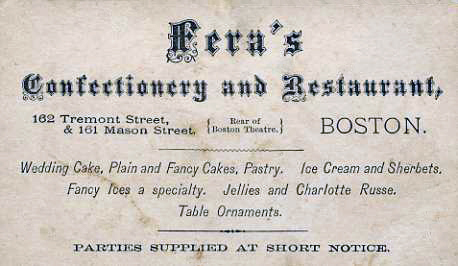 Boston’s first Chinese restaurant would open at 36½ Harrison in 1890. 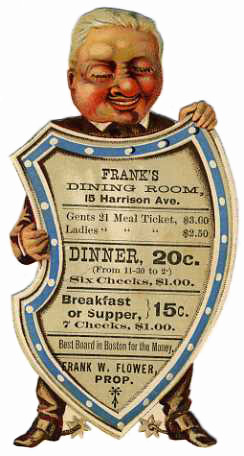 In 1882 Frank advertised that he sold a week’s worth of meal tickets to men ($3) and women ($2.50). He also had rooms for rent, both “box rooms” and “side rooms.” I remember some years ago when I read about single working people who rented small kitchenless rooms in Boston’s South End in the 19th and early 20th centuries. While visiting a friend’s apartment in that area one day, I suddenly realized that her cramped and oddly-shaped three-room apartment was in fact made up of one box room and two side rooms. By 1884 Frank was doing well enough to buy a nearly new 11-room Queen Anne house in Dorchester. He moved his restaurant to 19-21 Harrison about then. That location soon became problematical when the block was sold off to a developer who planned to raze the buildings and construct a large office building. That same year, 1890, Frank won the contract to feed 10,000 Civil War veterans coming to Boston for a week-long reunion. In other words, he would need to furnish about 210,000 meals in the space of a week, rather than his usual not-too-shabby 10,500. Though he claimed he nearly went crazy making all the arrangements, Frank felt confident he could handle the job by feeding 2,000 diners in five shifts for each meal. He contracted with a local baker for bread and the all-important baked beans; bought 3,000 new plates; had all the meat delivered to his door in a refrigerated car by Armour Co. of Chicago; bought four immense boilers that would steam 2,400 eggs at a time; hired 100 waiters; found a professional coffee maker who would turn 9,000 pounds of beans into endless streams of hot coffee; and paid 35 scullions to clean up. When the encampment was over the G.A.R. executive committee commended him on how well he had fed the multitude. Evidently the veterans were pleased with what they were served. 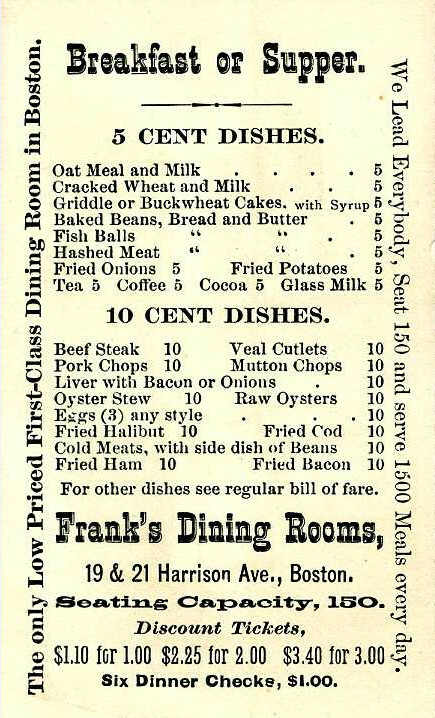 Nonetheless, Frank’s menu, repeated each day, gives a fair idea of why Boston restaurants of that time were not known for their fine cuisine. Frank’s Dining Room moved to 79 Harrison in the early 1890s, just about the same time that his original location became a Chinese store. But soon he hit the wall, declaring in 1894 that he was unable to pay his bills. His Dorchester mansion went back on the auction block. In the decades after Frank left Harrison Avenue, Chinese restaurants such as the Chinese Royal and The Red Dragon took over several of his locations.
. . . but not quite famous enough because many people still mistake the image shown here, dubbed “America’s first restaurant,” as a reproduction of a genuine Delmonico’s menu from 1834. It makes me realize how little sense of restaurant history most people have because this “menu” (probably not a menu at all but a newspaper advertisement or handbill) is definitely not from the genuine Delmonico’s, one of the country’s most elegant establishments. 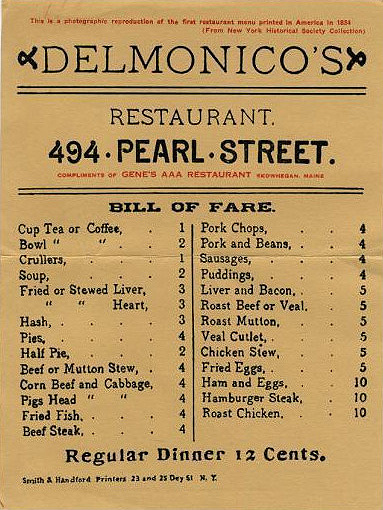 In 1831 Delmonico’s expanded from its original status as a confectioner’s shop into a Parisian-styled “Restaurant Francais.” In stark contrast, the “menu” shown above (this particular example was used to promote a modern-day restaurant) originates with one of the lowliest dives in New York City. Plus it’s nearly 50 years later than alleged. The prices shown are a fraction of what a Delmonico’s meal would have cost. The dishes shown are scarcely French fare. “Hamburger steak” was unknown by that name in the 1830s, first appearing in the 1880s. Although, like all fine restaurants, Delmonico’s could provide a guest with just about anything on demand, items like Pie, Crullers, Mutton Stew, and Pork and Beans would most certainly not have appeared in print. But then restaurants did not used printed menus in 1834. The true status of the advertisement above was unraveled by Ellen F. Steinberg and Jack H. Prost in an article called “A Menu and a Mystery” appearing in the Spring 2008 issue of Gastronomica. Recently, after consulting a book in which the fictitiously identified facsimile is treated as a valid Delmonico’s menu, I was inspired to dig up a few additional details. After exhaustive research, Steinberg and Prost discovered that the likely origin of this advertisement was an establishment at 494 Pearl Street in lower Manhattan run by “R. Barnabo.” His was a place where the poor and down-and-out found cheap offerings, possibly acquired by the proprietor as leftovers from other restaurants and hotels. The duo also discovered that the typeface on this document was not in use until the 1880s. They determined that this image made its modern debut as a facsimile of a genuine Delmonico’s menu in the 1930s, and was used in advertising campaigns for restaurants in the 1940s. Distributed by wire services, stories about the “legendary” low prices found on “America’s first menu” have cropped up as filler items in countless newspapers from the 1930s until the present. Syndicated columnist Hal Boyle made use of it repeatedly. And yet nobody, nobody!, ever asked, “Can it be true that America’s finest restaurant served cheap doughnuts and whopping great halves of pies?” And hamburger, a despised food for the poor until mid-20th century? Pigs’ heads? Here is what I can add to the story of R. Barnabo’s eating place known, perhaps humorously, as “Small Delmonico’s”: First, his name was actually Francisco Bernabo, born in Italy and naturalized as a U.S. citizen in 1882. He operated an eating place at 46 Franklin until 1879 when the property was sold and the restaurant was taken over by William S. Pontin. He then moved to 494 Pearl Street where he stayed until 1887 at which time he took a three-year lease at 6 Chatham-Square. He is listed at that address in 1888 but after that I cannot find a trace of him. Strangely enough, the prices shown on this 1880s “menu” are actually lower than would have been found in a cheap restaurant of the 1830s. They are typical of the “5-cent restaurants” of New York City in the 1880s which were located in Chatham Square where Bernabo moved in 1887. He may have bought food secondhand, but it’s also noteworthy that in the 1880s the bottom ranks of butchers were selling the cheapest cuts of Chicago beef to lowly restaurants for 1 and 2 cents per pound. According to MeasuringWorth.com a 10-cent hamburger steak in 1884 would be about the equivalent of one costing $2.29 today. In an interview for the story “What do we tip waiters for?” in the online magazine Salon, Steve Dublanica, author of the blog (and book) Waiter Rant, says that in his experience restaurant patrons, no matter what they may say in surveys, do not actually tip servers based on the quality of service. Rather, there are numerous other factors that influence why and how much they tip, such as social convention, mood, guilt, shame, or who knows what. Good advice. But it reminds me of one of cruder methods (“dodges”) servers used to employ in the 19th century to curry favor with regular customers — one that the restaurant industry has done its best to stamp out but that undoubtedly still goes on in places that have lax checking systems. It is to give selected patrons more or better food than they ordered – a porterhouse rather than a sirloin – while charging them for the cheaper item. The customer still comes out ahead even after rewarding the server with an extra-large tip. 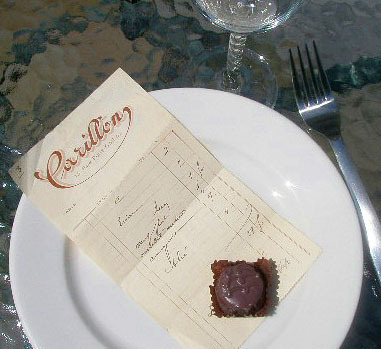 As early as the 1880s management tried to head off the game by installing a spy box (sometimes occupied by the restaurateur’s wife) in the pickup area of the kitchen, or by stationing a checker at the door to the dining room to see and record exactly what the server was delivering to the customer. Of course these tactics didn’t really work. By the 1880s Anthony E. Faust had established quite a culinary empire in St. Louis. He ran a Café and Oyster House downtown on Broadway which had a nationwide reputation. Since 1878 it had featured rooftop dining, uncommon in the U.S. then. From his adjoining “Fulton Market” he also retailed and wholesaled “Faust’s Own” oysters and other delicacies such as truffles, soy sauce, and curry powder which he shipped to Southwestern and Western states. His Faust label beer, made for him by the Anheuser brewery, was also sold in the West. He didn’t start out in the food business but as an ornamental plasterer who immigrated from the Prussian province of Westphalia at age 17. After being accidentally shot while watching a parade, he gave up his trade and decided to open a café in 1865. Obviously he had a knack for the new business. And it helped that St. Louis was a booming hub of shipping and commerce positioning itself to dominate commerce with the West. His closeness to the Adolphus Busch family of beer fame was undoubtedly another asset. In 1886 Tony opened a second restaurant in a huge new Exposition Building on Olive Street between 13th and 14th which hosted conventions of architects, music teachers, fraternal organizations, and the Democratic National Convention of 1888. In the late 1880s he razed his restaurant and replaced it with a finer building. With an interior of carved mahogany woodwork, a tapestried ceiling, and an elaborate mosaic tile floor, the restaurant catered to the fashionable after-theater crowd. At some point, perhaps in 1889, a second story was added, eliminating the rooftop garden (above image, ca. 1906). Success seemed to mean Tony could do as he wished. Caught serving prairie chickens out of season (under the frankly fraudulent name “Virginia owls”), he freely confessed and flippantly said he’d pay the fine or “break rock” if need be. When the Republican National Convention was held in St. Louis in 1896 he claimed his staff would not prepare or serve meals for Afro-American delegates. Even after the convention’s managers offered to hire a space, furnish stoves, and buy provisions to feed the black delegates if Faust would oversee the work, he absolutely refused to do it. Period. In preparation for the 1904 St. Louis World’s Fair (the Louisiana Purchase Exposition), Faust joined half a dozen of St. Louis’s top restaurateurs in a trust, the St. Louis Catering Company, probably designed to buy in large quantities and possibly to set prices too. 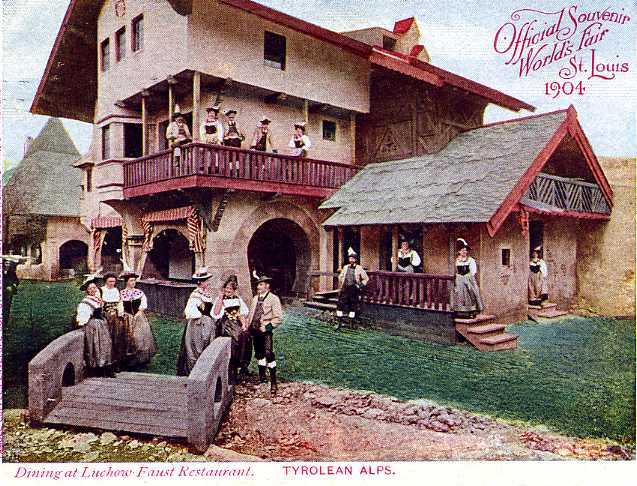 Faust went into partnership with New York’s Lüchow’s to create a Tyrolean Alps Restaurant at the Fair which seated 5,000 diners and featured costumed singers (pictured). It represented brewers’ interests as well, leading one observer to joke that the enormous beer hall should have been named “Budweiser Alps.” According to the Fair’s Official Program there was also a Faust restaurant in the Fair’s west pavilion on Art Hill. At the time Tony Sr. died in 1906 the Faust empire included a second Fulton Market location, and another Faust restaurant in the Delmar Gardens amusement park in University City managed by his son Tony R. Faust. Like many a successful businessman in the Midwest, Tony R. went to NYC to see about opening a branch there. There was a Faust restaurant in NYC’s Columbus Circle in 1908 (pictured), but I am not certain whether this belonged to the St. Louis Fausts. In 1911 Tony Jr. was declared insane. After that his older brother Edward, an executive of Anheuser-Busch who was married to a daughter of Adolphus Busch, took over the restaurants and markets. The downtown restaurants in St. Louis and NYC, and probably the others as well, closed in 1915 and 1916, casualties of looming Prohibition. 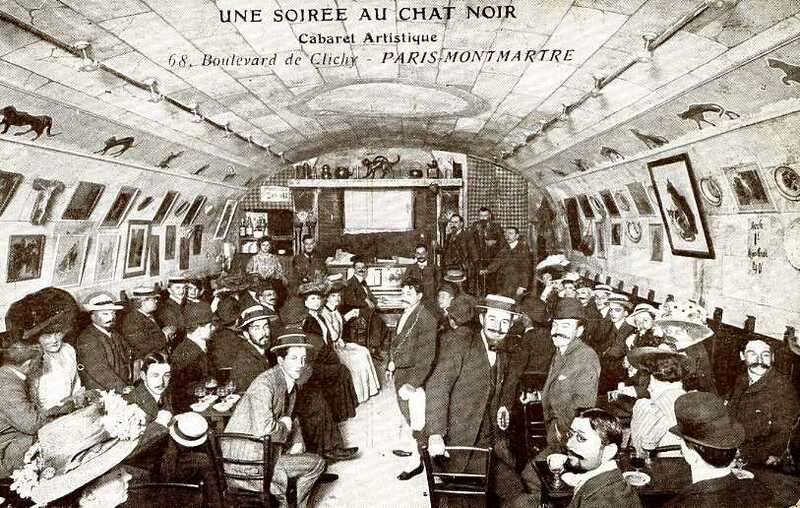 Credit for the development of the first theme restaurants goes to Paris cafés and cabarets which opened in Montmartre in the later nineteenth century. They were primarily drinking spots rather than full-scale restaurants but they served food also. 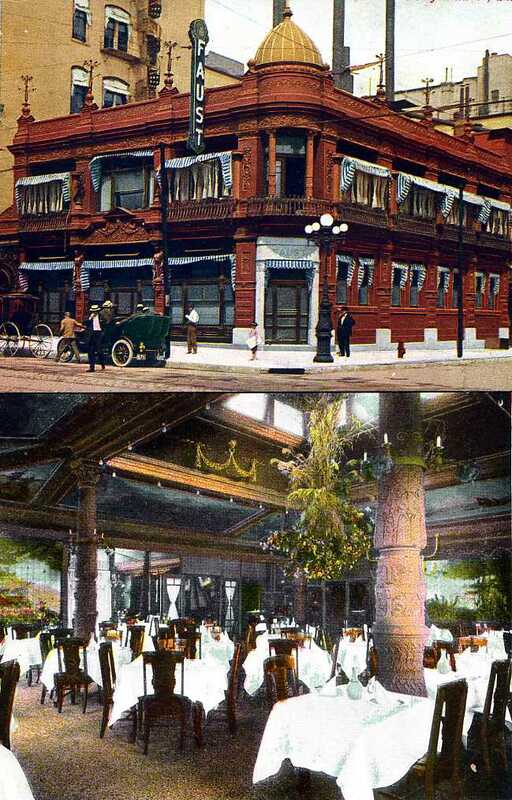 Like American theme restaurants today they were built around a concept and created an environment which appeared to be something other than a mere eating and drinking place. In their early years these artistic cafés had a counter-cultural impetus that in some cases celebrated the revolutionary Paris Commune of 1871 which had been rooted in Montmartre. 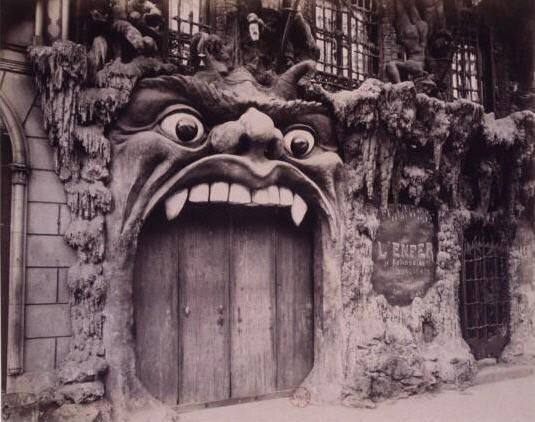 The Chateau d’If’ of the 1880s, possibly an imitator of the Café du Bagne, was designed to resemble the prison by the same name in Dumas’s The Count of Monte Cristo. Outside it had an imitation drawbridge which stretched from the street to a large oak door, while inside were cells and dungeons. The L’Abbaye de Thélème, with a medieval theme, dressed its servers as monks and nuns. 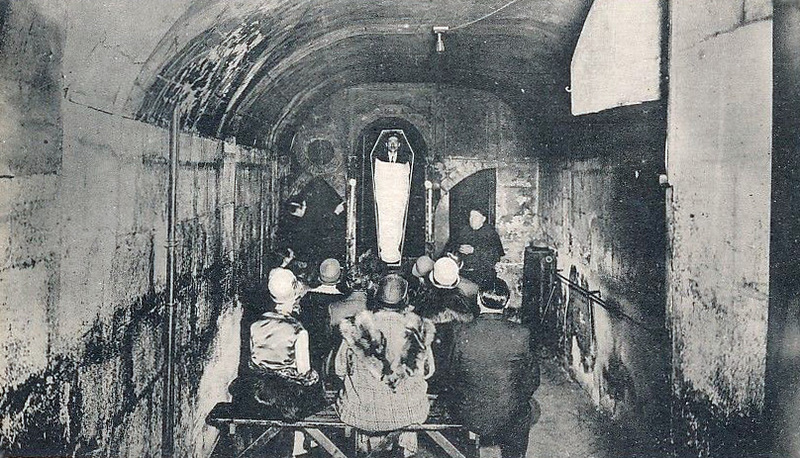 Many of the Montmartre cafés celebrated the macabre, with paintings and decor whose subjects included infanticide, crucifixion, and assassination, but in 1894 The Café of Death opened, furnished with coffins serving as tables. 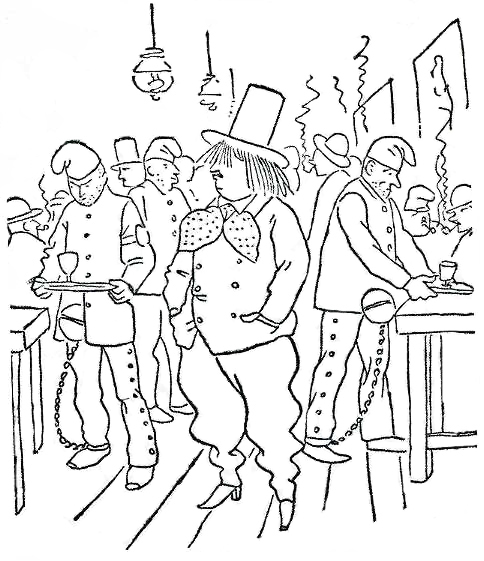 The police objected to its name and its habit of serving beer in imitation human skulls so its name was changed to the Cabaret du Néant [of Nothingness] (see above). The 1890s marked a turning point at which original owners left the scene, artists stopped coming, bohemianism vanished, and new café owners took dead aim at tourists. Certainly few of the popular cafés and cabarets of the early 20th century had much connection with earlier enterprises even when old names remained. 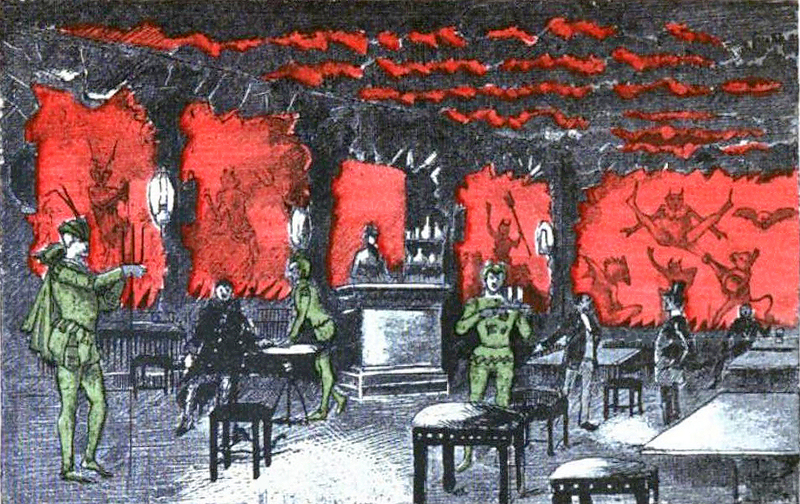 Many felt that the Café de l’Enfer (Café of Hell) exemplified the purely commercial type of enterprise. The spirit of Paris’s bohemian cafés passed into the United States first in New York City. Au Chat Noir was in business there in 1895, decorated with a wall frieze of black cats. Otherwise, though, it seemed like a fairly standard small French restaurant of the day serving dishes such as cold lobster, tripe, and deviled crabs. Later at least a couple of other cafés named The Black Cat appeared in NY and Coppa’s in San Francisco adopted a similar theme. 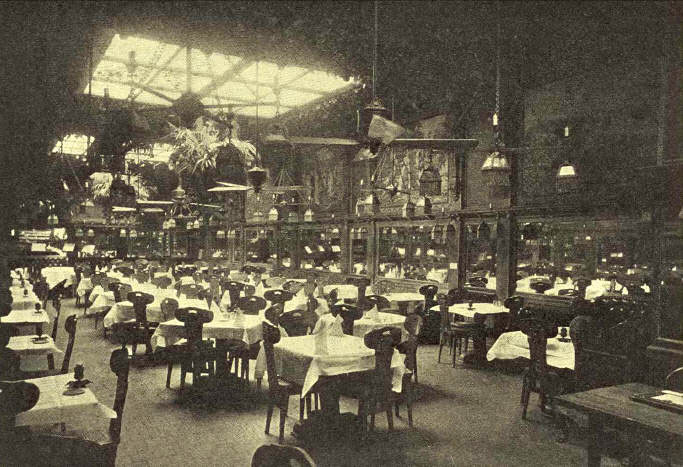 Other early theme restaurants undoubtedly inspired by Paris cafés include beefsteak dungeons in New York and elsewhere, as well as tea rooms and cabarets in Greenwich Village both before and after World War I, a prime example being the Pirates’ Den. As in Paris, theme restaurants and cafés rapidly lost any counter-cultural overtones.